Direct Marketing Communicate promising GSFC inventions to outside organizations (e.g., corporations) anticipated to have licensing / partnership interest. Conducted on a continuous basis. GSFC identifies target licensees / partners, communicates benefits-level information about inventions to those targets, vets interested parties, and facilitates licensing / partnerships agreements. NASA Tech Briefs Communicate promising GSFC inventions via NASA Tech Briefs – a magazine in existence for 20 years that announces new NASA technologies to a readership exceeding 500,000 per year. 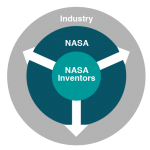 (check facts – just guessed for now) NASA Tech Briefs is published monthly, and contains inventions from all NASA centers including GSFC. Trade Shows / Conferences / Symposia Communicate promising GSFC inventions to targeted trade shows, conferences, and symposia. Conducted on a continuous basis. Local Events Communicate SPO/GSFC opportunities and successes at local events that involve entrepreneurs, inventors, government officials, industry, and related groups. Conducted as opportunities arise. Contact the SPO via techtransfer@gsfc.nasa.gov or 301-286-5810 to suggest new SPO outreach ideas.